The Adventures of Tintin: The Secret of the Unicorn Blu-ray Review. It's good to see Stephen Spielberg on his A-Game again... check it out! Directed by Steven Spielberg and produced by Peter Jackson, The Adventures of Tintin: The Secret of the Unicorn is a classic adventure movie that harkens back to the serials of yesteryear. For the uninitiated, Tintin was created by Belgian artist Georges Remi who wrote under the name of Hergé and the character first appeared in 1929 before becoming a world-wide phenomenon in the 1950's. 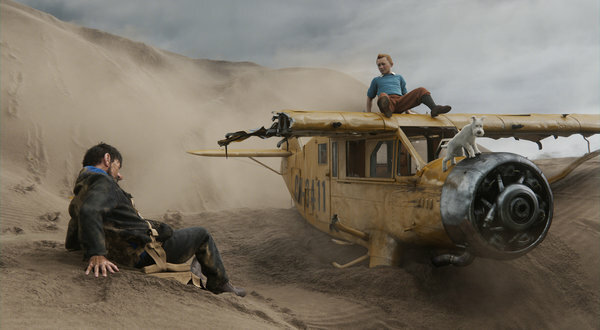 Joining Spielberg in this modern revival of the character are writers Joe Cornish, Edgar Wright & Steven Moffat who create this almost Indiana Jones type adventure as we follow the exploits of the red headed journalist Tintin and his loyal dog Snowy. The story begins with a great tribute to Hergé as an artist is making a caricature of our hero Tintin in his colourful home town and when this drawing is shown to the viewer, it looks exactly like a Hergé drawing. It's these subtle nods to the original series that makes The Adventures of Tintin: The Secret of the Unicorn such a treat to watch and when combined with the comedy of the British writers involved, there's plenty of gags to be discovered along the way. The catalyst of the story is an antique model ship that is based on the 16th century galleon called the Unicorn that Tintin purchases at his local market. Unbeknown to Tintin, this model ship has a greater mystery attached to it and when the villainous Sakharine (Daniel Craig) attempts to purchase the ship from our journalist hero, things become to fall apart when he declines. From here, Tintin is brought into a world filled with thugs, curses and an ancient booty of pirate gold. When his ship gets stolen and just like an Indiana Jones adventure, Tintin cannot turn down a good story nor justice as he attempts to solve this mystery that involves 16th century pirate battle and a family curse. Joining Tintin on his adventure is Captain Haddock, a captain who has been drunk more than he has been sober and together they attempt to hunt down the nefarious Sakharine before he can solve the mystery before them. With larger than life action scenes featuring boats and planes, the creators of Tintin have definitely paid homage to the ideas and artwork of Hergé that unfortunately may be missed by the modern audience. 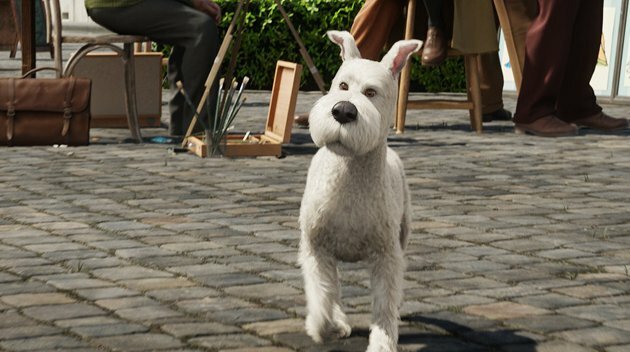 Although the character Tintin is quite the straight man, everyone else in his world are quite comedic like his little dog Snowy who manages to go one on one with a Rottweiler or drunkard Captain Haddock (Andy Serkis) who steals the story on just about every occasion, especially with his whisky breath. Craig plays the moustache twirling villain quite well, although some of the scenes do feel a little flat. My only gripe with the film is that The Adventures of Tintin: The Secret of the Unicorn was actually based on three of Hergé's comics that included The Crab with the Golden Claws, The Secret of the Unicorn and Red Rackham's Treasure which doesn't make the film flow that smoothly. At times you wonder how it is all connected, especially when Thomson and Thomson turn up in the middle of nowhere to arrest Sakharine after they finally catch their pick pocketer in another character. Nonetheless it's a spectacular looking film on Blu-ray. Using state of the art 3D motion capture animation thanks to Peter Jackson's WETA Digital company, watching this story unfold is quite uncanny due to the eerie realism of the characters who populate this film. 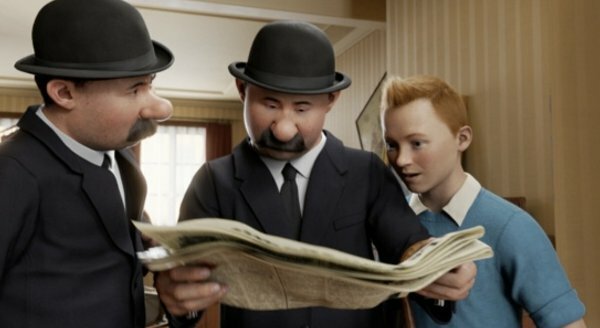 Best of all, the characters look like their comic book counterparts, whether it's Tintin with his red hair spike or the two incompetent policemen Thomson and Thompson (Nick Frost and Simon Pegg) with their bulbous noses. The animation used in the film is truly breathtaking, however the use of the 3D is a little lacklustre but there are a few in your face moments that makes you appreciate the genre. Audio is equally impressive and really makes good use of your surround sound system, especially when you hear the bullets whizzing past your head in your living room and the huge explosions. 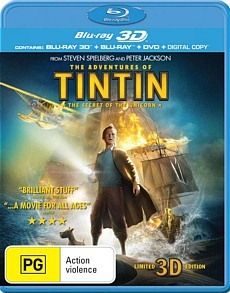 Add in four different media formats of the film that include Blu-ray 3D, Blu-ray, DVD and a Digital Copy plus a variety of special features such as The Journey of Tintin to Snow: From Beginning to End and the extras are not only quite informative but delve well into the creation of the film plus the diverse characters involved. The Adventures of Tintin: The Secret of the Unicorn is a fun move that although doesn't take itself too seriously is still an enjoyable ride from start to finish. At times the story does fall off the rails but thankfully it doesn't take too long for the story to pick itself up again, especially when the action commences. Add in the amazing 3D motion capture abilities from WETA Digital and this is easily the best looking CGI film to date. It's good to see Stephen Spielberg on his A-Game again... check it out!